This month's Band of Bloggers prompt is all about the Undead. Spoooooooky! There are countless (probably not literally) games that involve undead creatures or persons. Zombies are the most obvious. New zombie games are released ever year. They are perpetually part of the popculture zeitgeist. But there are far more undead creatures to play around with than merely zombies. 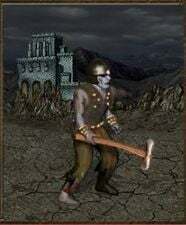 Warcraft III did an excellent job of crafting an entire RTS faction out of the Undead. 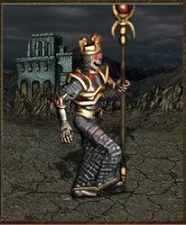 But there's another strategy game that utilizes undead and has been a part of my life for a very long time (and is my favorite PC game). Sadly, it seems to be forgotten by the rest of the world. There are several different types of bases. Each different type can create different types of armies. You have your basic Castle. That will make knights, pikemen, archers, and angels. There is an Inferno which creates fiends, imps, and devils. The Stronghold (which is what I usually main) produces hobgoblins, cyclopses, and behemoths. When you start a match, you typically have 1 of these. But you aren't limited to that one type of base. You can take over other bases and use their armies as well. You can wind up with a very diverse army of creatures. There is one really awesome faction that I'd like to talk about. The Necropolis. Skeleton Warriors are you basic unit. They are skeletons with armor on them. Skeletons are very interesting when playing necromancy. After every battle against enemies or monsters that you win, you will raise their corpses as skeletons, so you're always expanding your army. The only downside of this is you must return to your base to upgrade them to Skeleton Warriors. Here we have Zombies. They start off as simply Walking Dead and can be upgrade to zombies. Honestly, they are not very good units. Very limited in movement and they don't do much damage. Wraiths are awesome. They are flying creatures that can dart around the battlefield. When they fight another unit, they steal health from them and continually recover. They can be very hard to kill because of this. 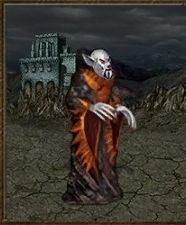 Vampire Lords are similar to Wraiths in that they can fly and steal health. They are beasts. Heave damage dealers. Power Liches are some of the best ranged units in the game. They fire toxic balls of magic across the battlefield that really lay down the hurt. Dread Knights are upgraded Death Knights. They are so overpowered. They are the most powerful units of their class. They are even more powerful than a number of units in the highest class of creatures. Their horses allow them great movement range. They take and deal massive damage. All of their attacks have a chance to curse their victims. But the key to their power lies in their Death Blow. Every time they attack they have a chance to deal double damage. 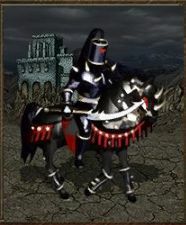 When you fight a Dread Knight, pray to whatever god your faction believes in that they don't deal a Death Blow. Ghost Dragons are definitely the spookiest unit in the game! Unfortunately, ghost dragons are not even remotely as powerful as their living brethren. They are the weakest top-tier unit in the game. But they look incredible! 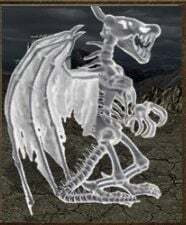 And I just really like the idea of dragons so filled with malice that they come back to life after death to haunt the world with spectral tooth and claw. Heroes III is a masterpiece. It is the finest turn-based strategy game I've ever played. Every gamer should experience it. 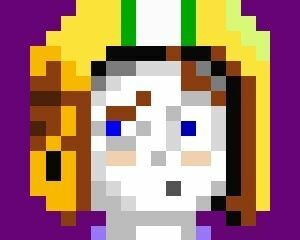 It's cheap on GOG.com (and elsewhere I'm sure). Any computer can run it (even my computer, which struggles to even open a web browser). If you haven't played it, do yourself a favor and download a copy. If you have played it, but not recently, do yourself a favor and play it again! 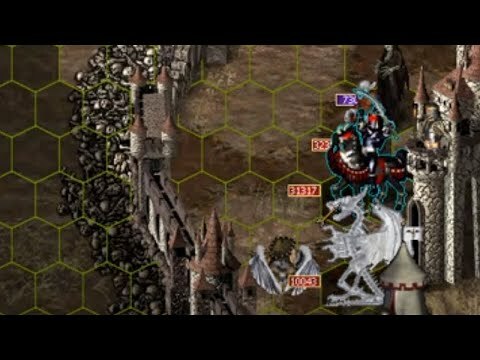 Have you ever played Heroes III? Tell me your thoughts on it! If not, what is your favorite turn-based strategy game?